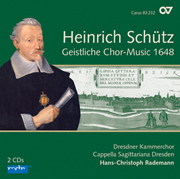 Heinrich Schütz is generally regarded as a master of the art of setting text to music, particularly the text of the Bible in its unaltered form which was of substantial significance to Lutheran doctrine. On the other hand, there are only few examples of settings of rhymed texts in Schütz's oeuvre. One of these is the so-called "Becker-Psalter," a collection of psalm translations by the Leipzig theologian Cornelius Becker. 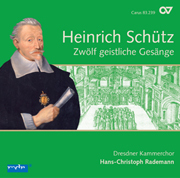 Shortly after the death of his wife, Schütz concentrated on this collection and set numerous verses to music. 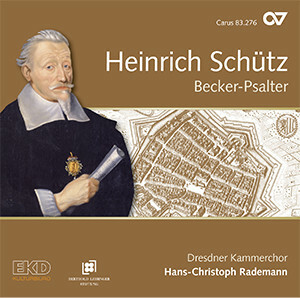 In the 15th volume of the Schütz Complete Recording, Hans-Christoph Rademann and his Dresdner Kammerchor present a colorful interpretation of a selection of these unusually unadorned, transparent, folk-like compositions. 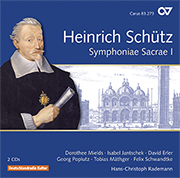 The cross-section of the CD is based on the selection of psalms that Schutz composed for his Psalms of David (Carus 83.255), thereby creating a sibling CD for these magnificent, multi-choral works. Hans-Christoph Rademann's interpretation is spot-on. The Dresdner Kammerchor sings with unaffected simplicity, letting the inherent beauty of these settings shine through. 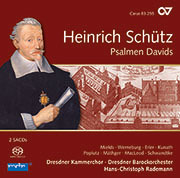 Assigning various soloists and chorus to alternating stanzas, he [Rademann] shows how inventive a simple hymn can sound. They [the singers] deliver excellent performances; the text is always in the centre and clearly intelligible. Hans-Christoph Rademanns Dresdner Kammerchor zeigt exemplarisch, wie diese Verse zu lebendiger Musik werden können. ... Rademanns Schütz-Einspielung setzt weiter Maßstäbe. Die CD bringt die schlichte, klare Komposition zur Geltung, wozu auch die hervorragenden Solisten ihren Teil beitragen.